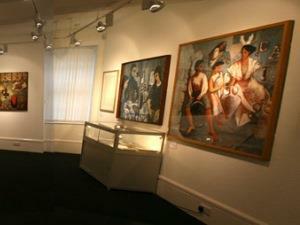 MOMA Machynlleth at Y Tabernacl01654 703355work Art GalleryMOMA WALES (Museum Of Modern Art, Wales) flourishes in four beautiful galleries alongside The Tabernacle, a former Wesleyan chapel which opened as a centre for the performing arts in 1986. The Tabernacle was converted from a Wesleyan chapel into a centre for the performing arts. Since then MOMA MACHYNLLETH has grown up alongside it in seven beautiful exhibition spaces. Throughout the year MOMA MACHYNLLETH shows Modern Welsh Art, featuring leading artists from Wales, works from the growing Tabernacle Collection, and in August selected entries from the Tabernacle Art Competition. Many of the works of art are for sale. The Machynlleth Tabernacle Trust has been awarded accreditation, by the Museums, Archives and Libraries Division of the Welsh Government, for its Museum of Modern Art. It passed with flying colours.